Police were deployed to help prevent violent clashes and the city's mayor had advised residents to stay at home. On Sunday, a crowd marched through the city and lit candles as a tribute the victim. A local pastor, Martin Olejnicki, said that every effort now had to be made to ease tensions, adding that the church would pray every day "for the victim, his family members and peace in the city". "It is always a kind of danger - we just had Chemnitz - and so things could escalate and I believe nobody wants that," he said. "That's why we are trying to appease all sides and to talk to people and tell them that it's not the moment to let things escalate." 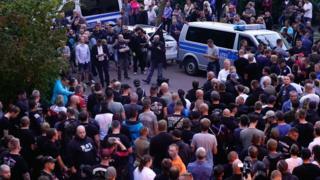 Earlier, neo-Nazi groups took to social media to call for protests in Köthen, which is about 160km (100 miles) north of Chemnitz, where a similar incident sparked violent protests two weeks ago. German media quote eyewitnesses as saying the fight in Köthen broke out in a playground when the man and his brother got involved in an argument. "Two Afghans were provisionally detained on suspicion of homicide," police said on Sunday. In Chemnitz a Syrian and an Iraqi were arrested after a 35-year-old German man was stabbed to death in a fight on 26 August. 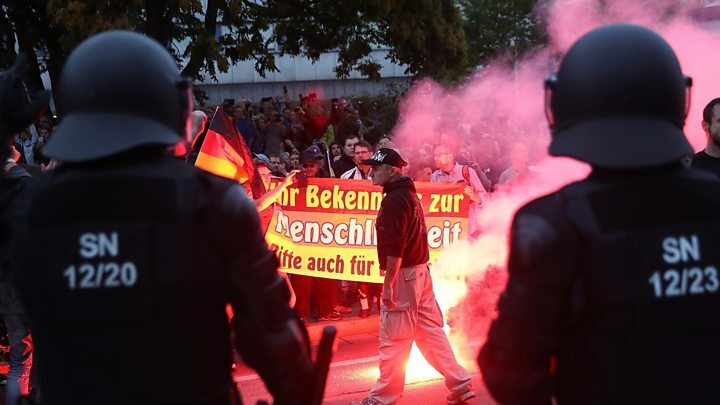 The incident led to clashes between far-right and anti-Nazi protesters and assaults on foreign-looking passers-by. Chancellor Angela Merkel has warned that "vigilante justice" would not be tolerated. Köthen is located in Saxony-Anhalt and Chemnitz in Saxony, two states where AfD is particularly strong.